Horbachevsky, Ivan I. [Horbačevs’kyj], b 4 October 1800 in Nizhyn, Chernihiv gubernia, d 21 January 1869 in Petrovskii Zavod, Trans-Baikal province, Russia. Civic and political figure and a Decembrist (see Decembrist movement). The descendant of an impoverished Ukrainian noble family, he was an officer in the 8th Artillery Brigade in Novohrad-Volynskyi. In 1823 he became a member of the Society of United Slavs and a representative to the Vasylkiv council of the Southern Society. 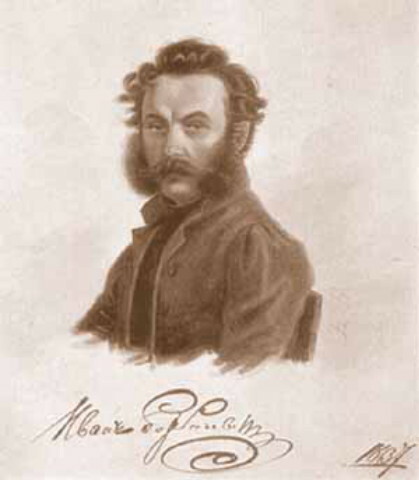 For participating in the revolt of the Chernihiv Regiment, he was arrested in February 1826 and sentenced to hard labor for life; the term was later reduced to 20 years. He served the sentence in the Trans-Baikal province, where he remained until his death. He is the author of Zapiski, Pis’ma (Notes, Letters, 1925, 1963). A referral to this page is found in 2 entries.